Roses may be red but their beauty can't compare to this garnet gemstone ring from Apples of Gold. With a vintage-inspired style and scarlet-colored stone, this piece is lovelier than any rose garden. 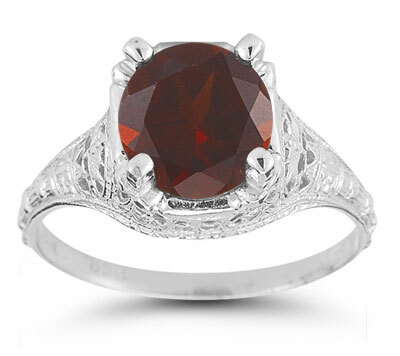 The garnet gemstone is a gorgeous focal point for the ring, which is forged from 14K white gold for an updated look. The band features intricate filigree to bring the vintage style to life. Open-air patterns and milgrain lines complete the look. We guarantee our Antique-Style Floral Garnet Ring in 14K White Gold to be high quality, authentic jewelry, as described above.